I'm really liking MYN better than GTD. Instead of having a bunch of context lists, now I have one short list based on urgency (yes, urgency, or "start dates"; the book explains why). The list is short because stuff to do/review in the future is hidden. First, it's remarkable how short it is, compared to my huge GTD lists. "High" is things that must absolutely be done today, even if I have to stay up late. "Medium" is things to consider doing in the next couple of weeks. Some of them are recurring (every 3 days, every 4 months, etc.). The starred ones should preferably be done today, although they don't have to be. "Low" is things that are "over the horizon" that I should at least review each week. 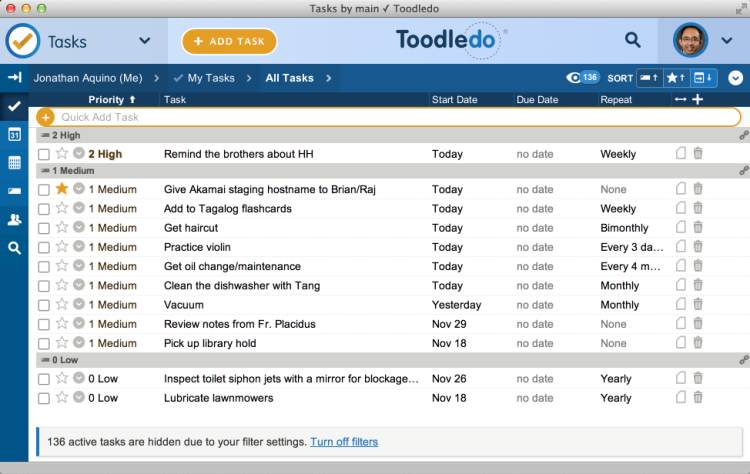 Also note what is not shown: the 136 hidden tasks. They are not shown because they have start dates in the future. Those are 136 tasks that I don't need to include in my weekly review, unlike in GTD. I really appreciate that. posted by Jonathan at 12/01/2015 09:14:00 a.m.